It is correct that most of us working in Singapore do not have enough spare time to read. But, I realized that without reading, our brain will go dumb day after day. So, I will need to find out alternate way to be able to read books while I was doing other things. So that I searched audio books online and downloaded them and put them into my mp4 player. While I am on the way to my workplace in the morning and on the way back to my home at evening, I listen those audio books. This can help me in two ways. It can improve my English language proficiency and help me to be able to listen those books that I do not have enough spare time to read too. And this is my pleasure to share these books I had listened. 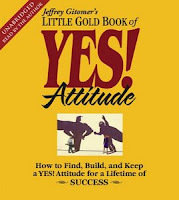 Here is a good inspirational book about Yes Attitude. I am still in progress of listening, haven’t completed yet. But I uploaded it for you all because I am sure it will help you in certain way. Here is a short description of this book. Jeffrey Gitomer, "The Little Gold Book of YES! Attitude: How to Find, Build and Keep a YES! Attitude for a Lifetime of Success (Audiobook)"
Every business winner has one thing in common: a YES! Attitude that's powerful enough to help them achieve the impossible! When you've got a YES! Attitude, you assume everything will start with "YES! "...and you'll find a way to "YES!" even when the first, second, and third answer you hear is "NO!" You say you weren't born with a YES! Attitude? No problem! Jeffrey Gitomer will give you all the tools you need to build one. As the world's #1 expert in selling, Gitomer knows more about attitude than anyone. He's brought those lessons together in the Little Gold Book of YES! Attitude and it will change your life! What makes this work unique? It's not just "inspiration": it's a complete, step-by-step, fully-integrated game plan for understanding and mastering your attitude. You'll learn 7.5 specific things you can do to maintain your intensity, drive, and commitment...discover 20.5 "attitude gems" that capture the value of thousands of dollars of books and courses...learn how to overcome the 10.5 most dangerous "attitude busters"...then learn how to maintain your YES! Attitude every day, for the rest of your life! Don't just listen to the Little Gold Book of YES! Attitude once: study it, live it -- and win. This book was uploaded as per request of one of my friends, Obama, (not the president of the United States, :) ) who is regular visitor to my blog. This book is written by Author Michael J. Tomlinson and John Woodward, this is fifth edition. I hope that it can help Obama. The increased adoption of piling is not only due to the availability of more efficient mechanical equipment. Developments in analytical methods of calculating bearing capacity and dynamic methods for load and integrity testing have resulted in greater assurance of sound long-term performance. Further economies in foundation and superstructure design are now possible because of the increased ability to predict movements of piles under load, thus allowing engineers to adopt with confidence the concept of redistribution of load between piles with consequent savings in overall pile lengths and cross-sectional dimensions, as described in this new edition. Since the publication of the fourth edition of this book, Euro-code 7, Geo-technical Design, has been issued. As the name implies this code does not deal with all aspects of foundation design; there are extensive cross-references to other Euro-codes dealing with such matters as the general basis of design and the properties of constructional materials. The Code does not cover foundation design and particularly construction as comprehensively as the present British Standard 8004 Foundations, and the British National Annex to Euro-code 7 is yet to be published. The authors have endeavored to co-ordinate the principles of both codes in this new book. Here, we have two invitations for the people who are looking for upcoming religious events in Singapore. One is the invitation of Birthday Celebration of Dr. Ven. Vicitta of Jayamangala Buddhist Vihara Monastery (commonly known as Clemanti Monastery). It will be held on 25th July 2010 starting from 8:00 am till 12:00 pm. For your details, you can give a call to monastery at 6778 1678 (or) 9118 3961. The location of monastery is 23A, Jalan Mas Puteh, Singapore 128628, and guide to reach there is: please take Service number 78 or 285 from Clementi MRT area (NTUC bus stop) and alight two bus stop later opposite Blk 701, near Esso Station. Another one is an invitation of ceremony of offering Waso Robe to monks. This is second time of Waso Robe offering ceremony held by Sisaparami Monastery. It also will be held on 25th July 2010 starting from 3:00 pm till 6:00 pm, and venue is the Informatics Campus near to Jurong East MRT station. For details, you can reach to monastery contacts at following numbers. 6524 6344, 8121 0493, 9120 2695, 9027 5317, 9227 7491 and location of monastery is at Blk 120, #01-81, Ivory Heights, Jurong East St 13, S600120. Just a quick update to all of my friends who are in Singapore and preparing to go back to Myanmar in near future. 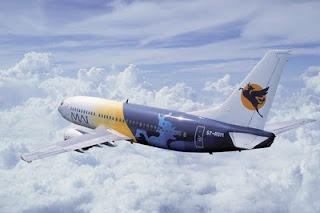 Now Myanma Airway International (MAI) is selling their tickets with promotional offer from SIN-RGN-SIN at S$ 309 only. This promotion start from today, 19th July 2010 and will end on 30th October 2010. The ticket will have two weeks in validity and you have to return back to Singapore by 30th October 2010, not allow to change dates at all. You all can buy tickets through ticketing agents in Peninsula Plaza. The only one thing you will need to consider is luggage allowance. It allows you to carry 20 Kg only. 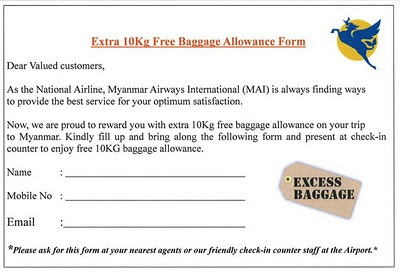 The other thing (assume most of people will knows this) I wanted you all to know is the coupon that allows you to carry extra baggage of 10Kg for your trip from Singapore to Yangon. I just found this MAI's Facebook Page. Hopefully, it can help anybody who already procured ticket with normal price. You can get this coupon on this page too. MAI says that you may need to fill up the form at any travel agents or at airport check in counter and please present the form at check in counter to enjoy FREE EXTRA 10KG. Unfortunately, it is applicable for normal priced tickets only and not applicable for promotional tickets. Hurry up if you are planning to go back Myanmar in between August and October. 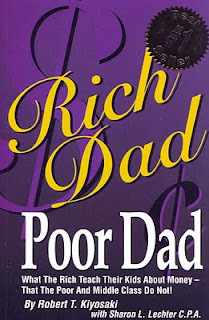 While you see the title of this book, a few of you will think that this is an old story and I already read this book for so many times, and nothing happen. Of course! Reading a book is useless unless you try the tactics shown in the book. It is sure that something will happen in your brain while you read this book. The only thing you may need to keep in your mind while you are reading it is to believe for a while whatever the author wanted to tell you. Nothing is impossible if you believed in it. So, first thing first, believe what author intends to show you. After reading this book, my point of view on matter of money also changed. For me, now I am at the first step of long run to the goal what I wanted to be in my life. So, I also want you to be like me too. For my friends who want to listen mp3 while you are reading this book, click here to read it online, and click on the play button of the music player below. Again, for friends who want to read this book in Burmese version, click on the below picture to download it in Burmese version. 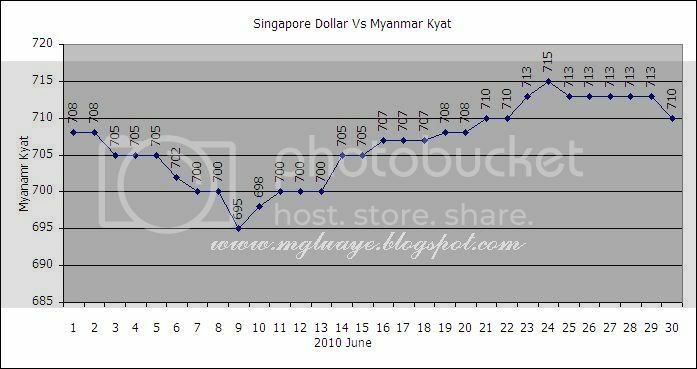 For the month of June 2010, the average exchange rate between SGD and Myanmar Kyat was 706.5333 Ks/SGD (2.8215 down from previous month average rate), highest was 715 Ks/SGD on 24th of June and fell lowest until 695 Ks/ SGD on 9th, of June. 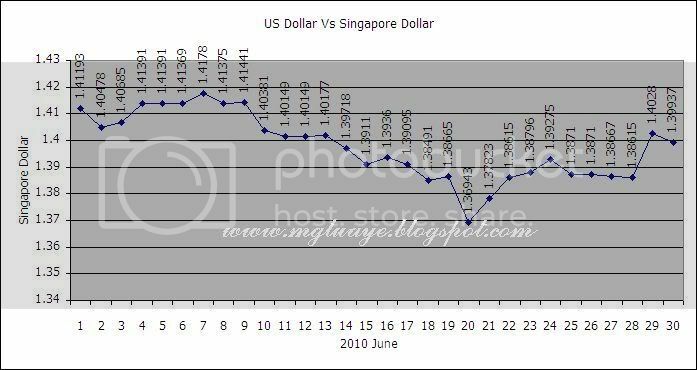 For USD vs SGD, the average rate for the month of June was 1.3976 SGD/USD (0.0033 up from previous month average rate), highest 1.4178 on 7th of June and lowest 1.3694 on 20th of June.